Baked potatoes can be pretty boring. There's always the usual toppings - butter, sour cream, salt, pepper... maybe even chives. I think they tend to be a forgotten side, not to mention a meal on their own! 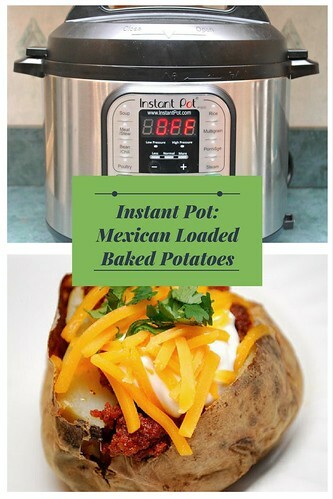 Tonight I served "baked" potatoes from my Instant Pot with Chicken Tortilla Soup, but not just the usual plain baked potatoes. Instead, I loaded them up with Mexican inspired toppings that complimented the soup. I used small potatoes since our soup was a hearty serving but if you wanted, these could serve as a meal in itself with large russet potatoes. Don't underestimate the lonely baked potato - use your imagination and top them with a slew of toppings, just as you would pizza! Add 1 cup of water and place steamer rack inside of IP. Using a fork, poke holes around each potato and set on the steamer rack. Press SAUTE and cook the pancetta until crisp. Remove from pot and set aside. In the now empty IP, add the celery, onion, carrot, bacon, garlic, bay leaves, and thyme to remaining drippings in pot and sauté until vegetables are soft, about 8 minutes. Add lentils and stir 1 minute. Add 10 cups broth; bring to simmer. When the IP beeps after pressure cooking for 10 minutes, allow your IP to naturally release pressure for 15-20 minutes. While naturally releasing pressure (also known as NPR or NR), the display will reflect numbers counting up from 1. The numbers indicate how many minutes the IP has stopped cooking since it beeped (or how many minutes it has been naturally releasing pressure). No need to touch your IP while it naturally releases pressure. The pin at the top of your IP will drop when all pressure has been released and it's safe to open. While the potatoes are pressure cooking, heat a skillet over medium high heat. Once hot, crumble the soft chorizo and saute until cooked through and crisp. Remove from oven and pierce with fork to create dotted "X" on top of the potato. Press in at ends of potato to push flesh up and out. Top the potatoes with chorizo, cilantro, cheese, sour cream (or any additional toppings) and season with salt and pepper to taste.